Really, I mean it. You've been warned. Let me begin with a bit of context. First, while a big fan of the Lord of the Rings film trilogy, I do feel they gradually diminished in quality. Many seem to think ROTK to be the best, whereas it seems the least good of the three to me. More, I saw it coming. The whole fantastic battle of Helm's Deep seemed impossible to top, which sparked a fear the filmmakers would to try for the third film and in doing so upset the balance of the story (because the siege of Minas Tirith is a side show, not the main action). Alas I was proved right. to be the sole remaining Orc in Sauron's fortress decides to kill Gandalf. Meh. But otherwise the scene looks great! But it feels like an earlier draft, and the context of it seems curiously absent. For example, I wondered at the lack of shots or lines noting the fortress really has been emptied. Perhaps as a trap? I didn't get it. Still don't. And certainly the business of Galadriel using her own Ring this way violates canon about how the Rings of Power work! I could go on. What comes out right about the scene seems extremely right, moving, dazzling and fun. This is what I hoped to see! What comes out not right feels puzzling, unfinished, uninvolving and sometimes (not really in this scene) both exhausting yet somehow dull. So it is for the entire movie! More, and this has ticked me off in all three films, I genuinely hate it when Jackson and company recreate moments from the earlier trilogy. Galadriel going all dark and evil witchy. The drums and lights in tunnels heralding the arrival of Orcs. The warrior maiden weeping over the man she failed to save at the end of the battle. The Arkenstone as a surrogate for the One Ring. Legolas once again demonstrating Bugs Bunny-like powers in combat (his Dad Thanduil does the same thing), even down to the weapon through the skull from above, and using one of the enemy's beasts as a mode of transport. The cartoon-like slide down a staircase (that should have killed everyone involved after all, including those children). A Wormtongue-clone. Give me a break! Jackson and his co-writers often make wonderful choices in adapting Tolkien to a very different medium than the printed page. Loved how Bilbo came to be knocked into unconsciousness while doing something important to the story, for example. A tiny point, yes, but demonstrative of excellent adaptation. Turning Lord Dain into a specific person (Billy Connelly as the fiercest of fierce warriors proved such a delight), just as giving Bard a family to protect--all good. Or not. The sheer number of characters weighed the story down after a time. Just as the amount of time that went into the actual battle coupled with all the extra elements--friggin' BATS for example--emotionally confuses. 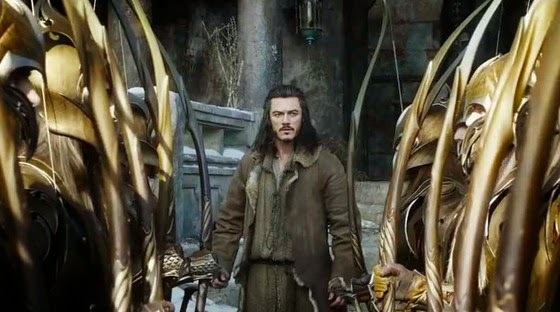 Much like the political intrigues of Laketown--could see no good reason for it save to turn two movies into three. Here's what I mean about what is both glorious and very poor in this trilogy and this film. Tauriel. Leaving aside my suspicion about why she has red hair (yeah, somebody saw Iron Man 2) which is supposed to be extremely rare among Elves, only seen in one highborn family--the whole idea of Tauriel intrigued me loads. Yeah, a female warrior is cool and all that, but what moved me most was how she retained the sense of Hope and Light her King seems to have lost. She never turned her back on the rest of the world. That she could even allow a dwarf into her heart said much about this extraordinary subplot, a story in its own way as moving as that of Beren and Luthien, of Arwen and Aragorn. No wonder she touched a raw nerve in Thranduil--she embodies the part of him he suppresses. But all that really ended up so poorly done. A writer myself, I keep seeing different ways to make that story work. Certainly I'd've liked to see Thranduil react to Tauriel mentioning Gundaban, where his wife died. More, the way her arc reached its climax left me cold, unsatisfied. Just a replay of Eowyn over the body of Theoden, with the added (and unrealistic frankly) notion of her never having felt loss or love before. I pondered, and as a writer, here's what I found myself wanting to see. 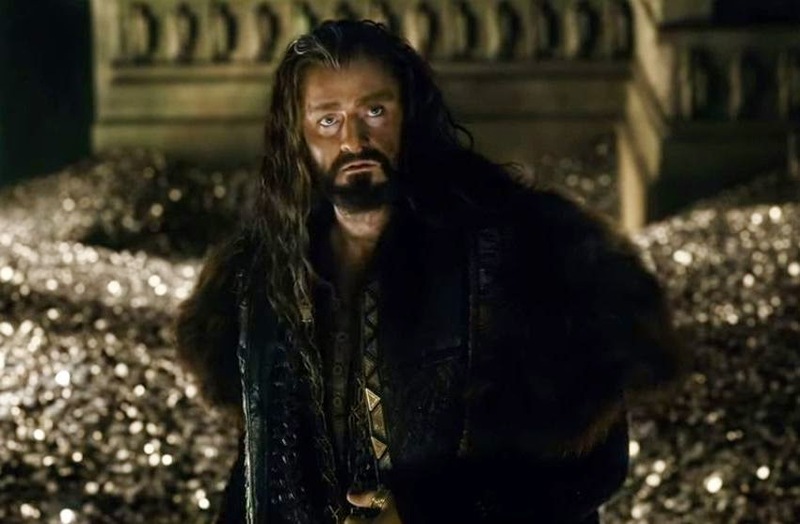 My expectation was for Tauriel and Kili to die in battle together, but that would have echoed Thorin's end so avoiding that makes lots of sense. Rather, I would have had Thranduil proven even more contemptuous of Tauriel, but after the battle in which he finally let loose his full rage and thus could feel again, he walks among the many dead and dying. He sees others tending the sick. Kissing their loved ones goodbye. He comes across Kili's corpse, Tauriel very nearly dead and bleeding beside him, having managed to crawl to him and hold his hand. 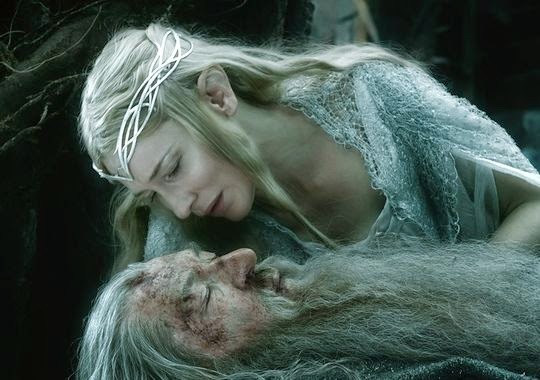 Thranduil then heals Tauriel himself, for which she at first feels no gratitude at all. But instead of defending himself, he lets her weep and scream, recognizing his own grief in her. As she winds down, they look at each other, each of them with tears in their eyes--a shared visceral moment without any "on the nose' dialogue. But that is just me. Wanted to get that off my chest. Honestly, I could go on and on about the different elements of the film--many of which (including the performances) really do shine and thrill. But with so much time and effort going into the look of it, into one spectacular special effects shot after another (let's have giant worms suddenly gnaw out tunnels for the orc armies, yeah! ), the story and characters did suffer. Much as they did with ROTK, only moreso. Still worth seeing if this is your cup of tea. I do intend to buy a copy on DVD and hope to watch lots of cool special features. At its best, this second trilogy really does deliver magical moments, delightful scenes and characters, stupendous vistas and exciting stories. 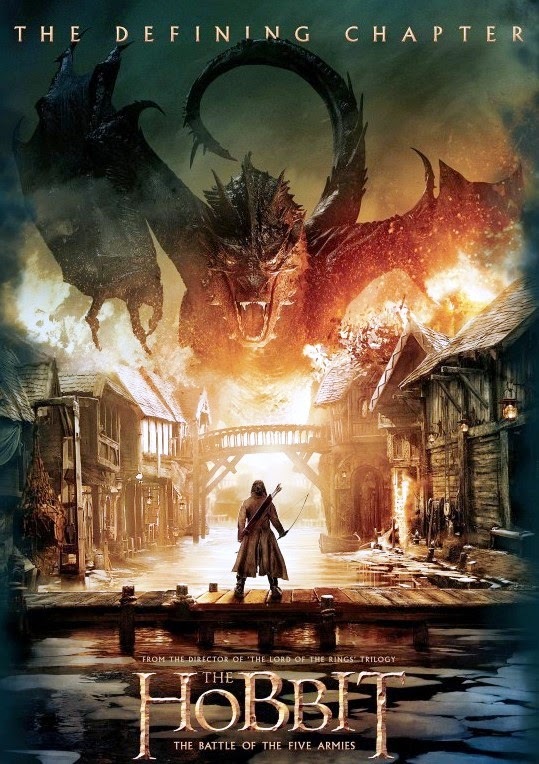 I have complaints as well, and must say The Hobbit simply is not as good as Lord of the Rings. This trilogy does seem to be setting up another movie or movies, one focusing on Legolas and probably Tauriel getting to know Aragorn--who will have to be recast, evidently, as well as possibly on Saruman (who, alas, would almost certainly have to be recast--Sir Christopher Lee does a wondrous job but is 93 this year). Honestly, I hope someone else directs. I still wish Guillermo del Toro had directed these flicks. Just my humble viewpoint. As ever. 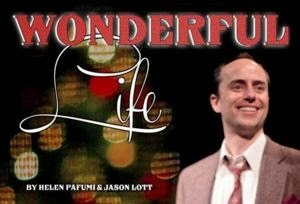 Jason Lott performs a one-man adaptation of the Christmas film classic Its a Wonderful Life for the second year in a row. Right up front let me predict he'll do this show he co-wrote (with Helen Pafumi) many more times in a lots more venues. The reasons seems simple enough. To begin, Wonderful Life admirably boils down and re-tells the perennial classic into a new format without seeking to somehow reproduce a motion picture on stage. That way lies madness, or at the very least near-certain failure because the two remain such different media. Rather than even try, the authors made their play first and foremost a theatrical experience, one where a shift of lights or simple sound cue coupled with a shift of position transports us via our imagination anywhere the story demands. No elaborate soundscapes nor super-detailed sets. In fact we only see a black space and a bench. Likewise the flow of the story feels the way a story does when related by a good narrator. Not necessarily linear, at least not in terms of time and space. But emotionally, yes. Very much so. I especially like how we learn details of the story as we need to--not in terms of data retrieval but for purposes of emotion, feeling, the visceral sense of this tale. Likewise Mr. Lott's performance sucked me right into the tale. That he never seemed to try and copy any of the actors in the movie is all for the good, indeed excellent, and generally the major characters come across as genuinely complex individuals. This often proves a trap, at least in my experience, in playing overtly "good" characters because it seems so easy to play them without nuance. Mr. Lott does all this admirably. More, he sustains our interest and sympathy for seventy full minutes. Without that, the story wouldn't work. Like A Christmas Carol, this story (which is in some ways a mirror image of Dickens' classic) has been told and retold, revised and remounted time after time. But if we don't care for the characters, if we don't believe in them, we are not moved. I was moved. Quite a lot. Indeed the only wrong note in what was otherwise a tour-de-force was treatment of the villain of the piece, Mr. Potter. While giving him a little backstory was great (really--this seems like the only time anyone's ever bothered to do that--KUDOS) giving him all kinds of political rhetoric that sounded "on the nose" almost undid it. He ceased for awhile to be a human being (only for awhile though) and more like a straw man for terrible, terrible ideas--but put into words that rang false. Overall, though, I thoroughly enjoyed and praise this performance and encourage anyone who wants to dive into the Holiday Spirit to see this if they get the chance! Good theatre often generates a sense of deja vu. A sense of the familiar, the already known, a memory brought to life on a visceral level. More than once, for example, I've watched a play and with something like a chill said to myself (about someone portrayed on stage) "That is me." Such proved my experience in viewing Morrison Christmas at ZJU. I felt thirteen again, back in the 70s when black lights and weirdly hypnotic music coupled with swirling patterns of color and stream of consciousness words. Didn't much like it then. But I was a kid. And I never forgot it. Morrison Christmas is one of those pieces I like to call "Theatre of Dreams' which has become pretty much a staple at ZJU. In keeping with the holiday, though, this show eschews the spooky and the creep out in favor of mysticism a la Jim Morrison himself. Every single moment felt like the recreation of a genuine religious experience, a Mystery Play for those who need to get past trappings of the safe, the complacent, the too-familiar. Fourth Chakra stuff. Equal parts mardi gras and meditation, both celebration and contemplation. Life and death, individuality and union, animal and spirit. Enacting the central mystery of the transcendent Divine awakening within a doll of flesh and bone and blood, surrounded by bars of time and space. I honestly cannot imagine a more appropriate subject for Christmas--the festival in the name of a Jewish Boddishatva. Josh T. Ryan is one of those directors whose work always fascinates and enlightens, so much so I kick myself for missing any work in which he's involved. Of the cast of Morrison Christmas, I'm familiar with about a third. All accomplished what this kind of performance needs--a kind of vivid individual charisma and talent, a commitment to the experience. Alex Walters falls so smoothly (I suspect not effortlessly) into the flow of this event he brings us along from the very start. He's the first ensemble member we see, guitar in hand and song to sing. He's followed by the rest--Amir Khalighi, his natural intensity grown stronger, Chelsea Rose ever increasing in her skills at precisely this sort of theatre, tigress Vanessa Cate showing us vulnerability just as powerful as her usual strength, Cheryl Doyle (just as interesting and as fearless as the last time I saw her--which was well into the level of excellent), Alison Stolpa and her quiet intensity (especially the way she listens), Marc Erickson who manages to seem both human and unworldly, plus Cynthia Salazar and Olivia Spirz and Brenda Nicole Walsh. in pain just before the show began. I started having some muscle spasms in a limb. But after awhile, I just didn't pay attention to any discomfort. What was before me took all my attention, and I left the theatre with a rather deep smile on my face. What more, really, can I say? Here we go again. I can almost hear the tiny internal groan at the news of yet another production of THE Christmas story, the one rendered into cliche by repetition, reinvention, parodies, tributes, reinterpretations, etc. 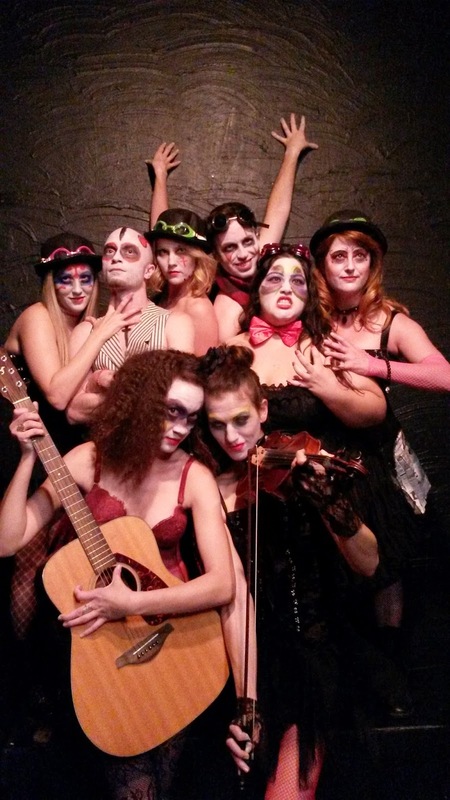 What after all can Zombie Joe's Underground Theatre Group bring to the table that a whole slew of previous productions, including musicals and muppets, have not? Well, a different cast for one thing. Any dramatization depends on that, and experiencing a good performance frankly is its own reward. Don't you think? But if you're looking for a new twist, the current production by ZJU of Dickens' classic also has a distinct 'steampunk' flavor. Does that count? Me, I'd go a bit further. A Christmas Carol in all its incarnations doesn't remain popular due to some weird media conspiracy. No, when done right (with Mickey Mouse, Doctor Who or Alister Simm) it remains a tale that works. Dickens created a ghost story, one in which the past actively reaches out to the present and grabs it by the scruff of the neck to give a good shake. But more, it tells a story that is at the very heart of what we most hope Christmas to be--a time when remember to be kind, that we need not suffer loneliness, that love really does exist. With Ebeneezer Scrooge (a wrenching performance by Sebastian Munoz) we see a very special fantasy played out. The second chance. Who of us does not at some point or other long for that? But again, it just won't work without good performances (nearly always requiring a director with enthusiasm, vision and a keen eye, Denise Devin in this case also playing the various Ghosts of Christmas). This show has that. Now, ZJU mounted this production last year and does pretty much the same frenzied, fascinating, roller coaster as before. The plot, startlingly, is all there. Frankly, it usually is not. One of my favorite moments has always been when the Ghost of Christmas Present reveals two hideous gaunt children--their names are Want and Ignorance. We see this. Likewise we not only get to see Scrooge's face as he watches the love of his life (Lara Lihiya-- who as violinist in the show's Steampunk chorus, lets loose her inner goblin) walk away from his youthful self, but his expression upon seeing her now--seeing the family that could have been his. All this works, not simply because it zooms without letting us get bored by a story we already know (really, the whole performance clocks in at about sixty minutes) but hitting the emotional moments, including bits of silence and waiting. Bob Cratchit (Jason Britt) and his wife (Redetha Deason) especially do wonders with quiet joy and even more quiet, but searing grief. 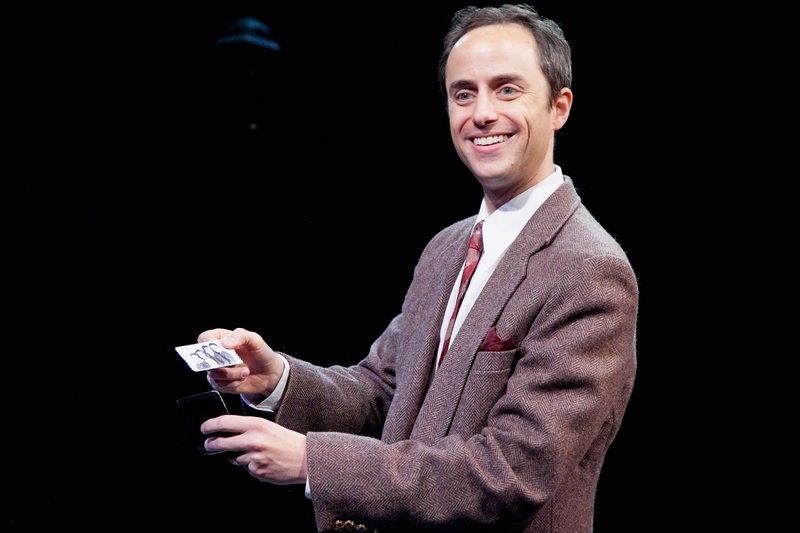 They give among the top performances in the show, but then they have to--if they don't love Tiny Tim (Courtney Drumm) for example, we the audience will not. The whole ensemble does a fine job, not really in exploring the dark recesses of the Human Condition, but in telling this story. This specific, hope-laden tale intended to move and give comfort, reminding us of the light in the dark and the warmth amid the chill. 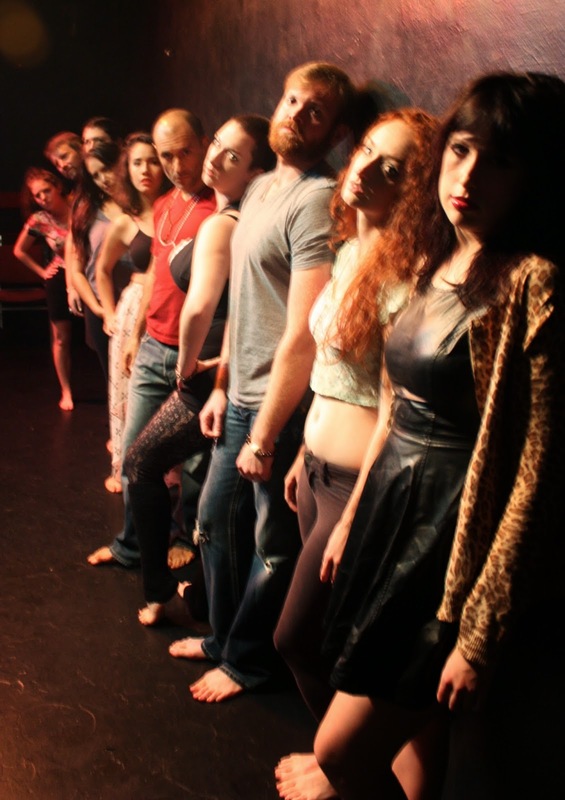 Kudos to everyone, such as Gloria Galvan, Patrick Albanesius, Sarah Kessler, Kelly Rhone, Kevin Pollard Jr., and A.J. Sclafani, each of whom played a variety of roles and managed to make it clear to us that fact. No small feat, incidentally. This story can be so very cloying, so by-the-numbers. But this production, with this cast and crew, summon up the magic that made Dickens novella re-read to this day, over 175 years since it first appeared in print. 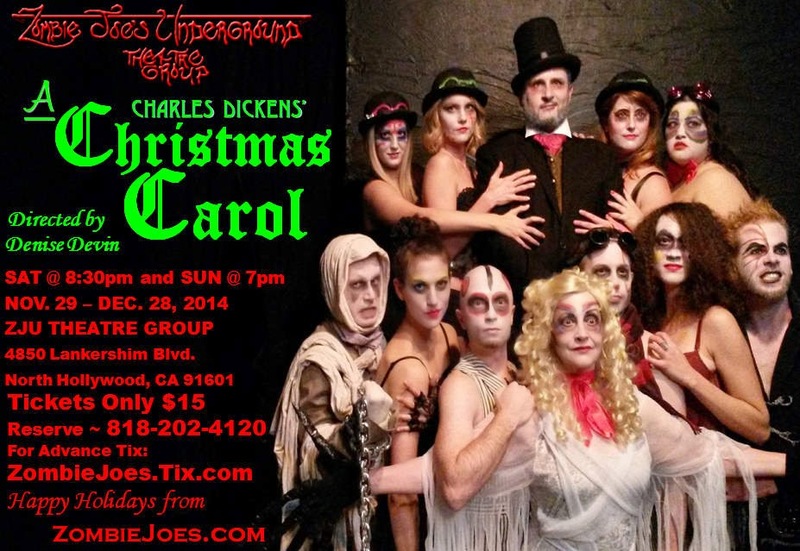 A Christmas Carol runs on Saturdays at 8:30pm and Sundays at 7pm, through December 28, 2014. Tickets are $15. 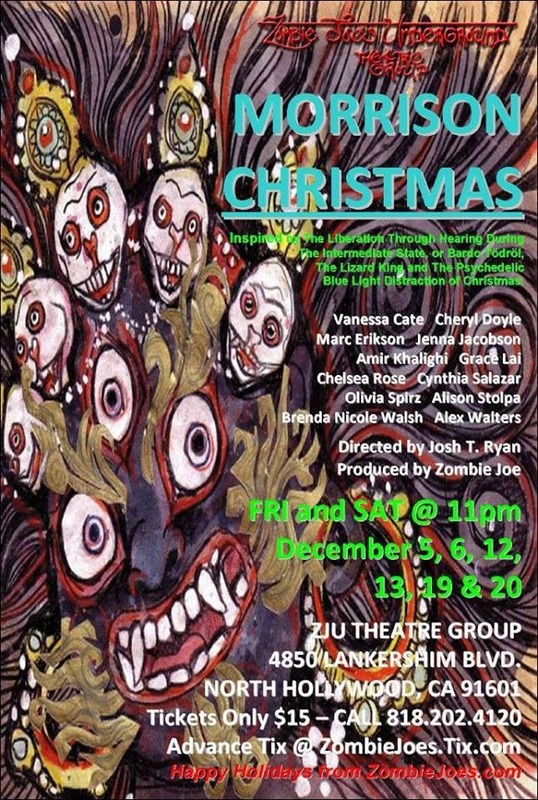 For Reservations call: 818-202-4120, or go to ZombieJoes.Tix.com . Zombie Joes is at 4850 Lankershim Blvd. North Hollywood CA 91601 (north of Camarillo, south of the NoHo sign, across the street from KFC).